Earlier this month the National Gallery announced that they are putting on a very exciting exhibition next year; Mantegna and Bellini. Following the success of Michelangelo & Sebastiano (read my review here: www.art-theoria.com/michelangelo-sebastiano/) it is no surprise that they have chosen to juxtapose and focus on two masters of Italian painting again. Although I am sure the exhibition will draw heavily from the vast collection at the National Gallery, I am excited to hear what other loans they have secured. In my opinion, a dream loan would be this, Saint Sebastian (c.1480) by the younger of the two artists, Andrea Mantegna. I was thinking about this painting a week or so ago, when my brother asked me what I thought was the best religious painting. I think that images of saints and martyrs are often the most powerful, because they focus on the individual experience of suffering and faith and are more emotionally relatable. A visual story can be told through one key moment of their life, which the viewer (religious or not) can empathise with both physically and spiritually. When I think of St Sebastian, this is the defining image that springs to mind. It is simple, powerful and compelling, and Mantegna was clearly inspired by the subject as he completed three paintings of him – this being the second and the largest. In turn it inspired other artists, as it was repeatedly imitated. As a young man Andrea Mantegna was a student of ancient archaeology, and the inclusion of highly detailed architectural features show his talent and passion for the subject. I love the inclusion of the marble foot to the left of the saint’s own feet, which looks like it came from a statue of a pagan god. Compositionally it does not reflect any tradition, and Mantegna designed this painting so that is has an impact as well as reflect his interests as an artist. 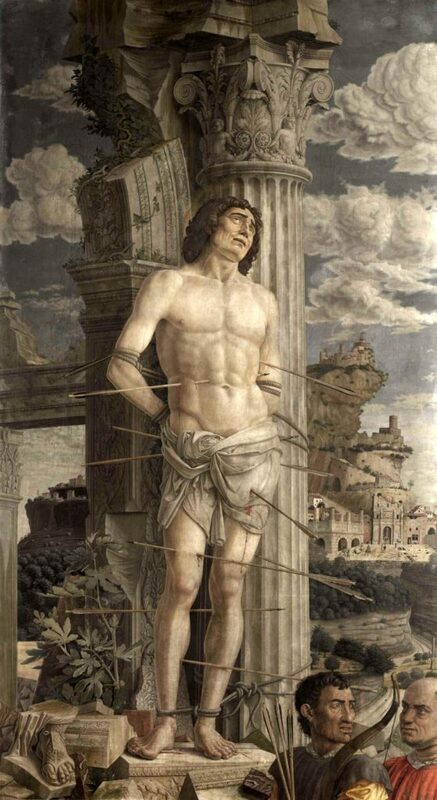 St Sebastian appears more like a sculpture than a human, his flesh is pale like the stone column he is tethered to and he is still and calm in his moment of martyrdom. His body is beautifully idealised like an Ancient Greek statue, and the contrapposto further emphasises this. The artist skilfully plays with perspective to make us feel as though we are at the same level as the archers looking up at the saint, while simultaneously making Sebastian seem monumental by literally raising him on a pedestal before us. The backdrop landscape is interesting, it reminds me of Bruegel the Elder‘s Tower of Babel (c.1563), with its precariously built city depicted in clear light. Perhaps it is a metaphor for the challenging upward struggle towards heaven, as the city on the cliff is said to resemble Jerusalem. It has a very low vanishing point, forces the action in the foreground further towards us, further enhanced by the valley in the middle ground. This shows Mantegna’s technical ability and understanding of perspective in painting, and he manipulates it with apparent ease. The more I look at this painting the more I discover. I said above that I thought it was a simple image, and the key part of it is, and that is its beauty. You can see it at a glance and understand who it is, but the artist allows us to read into it on different levels, which is what I think makes it so enduring.